For research mathematicians, it’s an all too familiar occurrence. You hit a roadblock, a simple-seeming question that just isn’t in your area of expertise. It feels like the kind of question to which someone out there must already know the answer — but that someone is not you. In the old days (in other words, more than a year or two ago), your best bet might have been to seek out a relevant expert at math department tea — that is, if you were lucky enough to work in a large department made up of representatives from a wide range of disciplines. If you worked in a small math department, however, you might simply be stuck. But today math department tea has gone online, in the form of a Web site called MathOverflow. On the site, mathematicians from all over the world ask and answer each other’s questions, chiming in on such topics as stationary non-isotropic spatial stochastic processes and symmetric sequences of blow-ups for a Fulton-MacPherson compactification. Post a question on MathOverflow and the answer typically comes back within an hour or two. “It has changed the way math is done, more than I thought possible,” says Ravi Vakil, a mathematician at Stanford University who has served in an advisory role to the Berkeley graduate students and postdocs who created the site. In the year-and-a-half since MathOverflow was launched, more than 4,500 users, ranging from advanced undergraduates to mathematicians at the top of their fields, have posted or answered questions on the site. Thousands more “lurkers” read the posts without adding their voices. Many collaborations and research papers have arisen out of MathOverflow interactions, some of them between mathematicians who had never met before posting on the site. The core appeal of MathOverflow is its wide variety of interesting and highly advanced questions and answers. 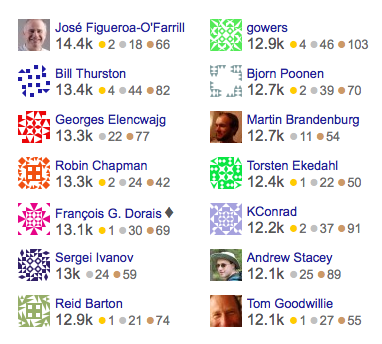 At the same time, MathOverflow’s creators have intentionally cultivated a game-like atmosphere — for example, users can garner “reputation points” and “badges” — which can make the site addictive, even for mathematicians whose reputations need no boost. The site has attracted a core of loyal users, many of whom would turn up their noses at more frivolous sources of internet addiction, such as Facebook and Twitter. MathOverflow was born in one of the places where it is perhaps least needed: the University of California, Berkeley, which boasts more than 250 math faculty and graduate students spanning a wide range of research areas. Yet even there, hitting up against a question outside one’s expertise and not knowing whom to ask isn’t an uncommon experience. A couple of years ago, Berkeley graduate student Anton Geraschenko starting mulling over the idea of using the internet to “tap into a Borg-like consciousness that houses all mathematical knowledge.” He began talking to other graduate students and postdocs about the idea of using something like a wiki to collect mathematical ideas. 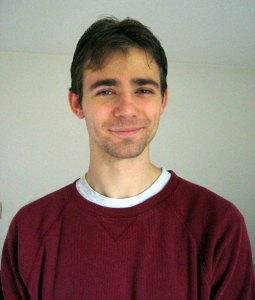 Then fellow graduate student David Brown, now an assistant professor at the University of Wisconsin at Madison, showed him Stack Overflow, a popular Web site on which professional computer programmers can post and answer each other’s programming questions. Stack Overflow seemed to be doing for programmers exactly what Geraschenko wished to do for mathematicians — offer them a way to turn to their community for help with the kinds of specific, answerable questions that someone out there must know the answer to. And the aspects of the programming community that made Stack Overflow work so well were also present in the mathematics community, Geraschenko decided. “The mathematics community is exactly rigged up to make such a site work,” Geraschenko says. In a stroke of luck, just a couple of months after Geraschenko started thinking about how to create a version of Stack Overflow for mathematics, the developers of Stack Overflow announced the creation of Stack Exchange, a platform for building “overflow”-type projects. To help their business get off the ground, they offered to host MathOverflow and other early overflow projects free. MathOverflow’s success may be due in large part to its clear mandate: it is for questions that are specific, answerable, and research-level but not so hard that they would constitute a research program in themselves. In other words, it is for tackling the lemmas of the mathematical world. The creators of MathOverflow have an equally clear vision of what the site is not. It isn’t a social networking site for mathematicians, nor is it a site where they can engage in long discussions about controversial topics in mathematics. “There are already lots of places on the internet where you can go to hang out with technical people – that problem is already solved,” Geraschenko says. The site states clearly that MathOverflow is not a discussion forum, or an encyclopedia, or a homework help site. The site’s moderators have the power to delete questions they feel belong elsewhere. In the beginning, MathOverflow’s creators encountered some push-back from mathematicians who wanted to broaden the site’s mandate. MathOverflow does offer a separate forum, meta.mathoverflow.net, where users can discuss controversial MathOverflow issues, such as why a question was deleted. The forum gives the site’s moderators a place to analyze tricky issues and reach a consensus. Meta also serves the crucial purpose of diverting flame wars and all the excesses associated with internet discussion forums away from the main site. Any time something unpleasant gets started on the main site — someone insults someone else, say — the discussion is immediately moved to meta, where the rules of discourse are more relaxed. “Meta serves the role of maintaining purity of purpose for the main site,” Geraschenko says. An essential element of the running of MathOverflow — and a key part of its appeal for some mathematicians — is its system of reputation points. As users garner reputation points, they can win any of various “badges.” For example, more than 3,000 users have earned “Student” badges, meaning that one of their questions received at least one up vote. Ten users have earned the “Famous question” badge, awarded if a question garners 10,000 views. More important, reputation points earn users privileges on the site. users can’t vote up a question or answer until they have at least 15 reputation points; voting a question down requires at least 100 points (and also costs the user a point, to discourage voting down in all but the most extreme cases). A user with 3,000 points can vote to close a question to further comments, and one with 10,000 points receives access to various moderation tools, such as the ability to delete a closed question. While the system of points and badges may seem gimmicky, it enables MathOverflow to scale well as it grows. For one thing, the voting system creates an easy, decentralized way for the community to decide for itself which are the truly interesting questions. “Since it’s a really large community where not everyone knows everyone else, the reputation system is very useful for filtering out some of the rubbish,” says Fields medalist Terence Tao, of the University of California, Los Angeles, who uses the site frequently. The reputation system also serves a less exalted function: by tapping mathematicians’ competitive instinct, it turns MathOverflow into a fun and, for many, addictive game. And since whoever is the first to answer a question has a better chance of winning an up vote, the reputation system provides incentive to answer questions promptly. The reputation system, Greg Kuperberg theorizes, appeals to the same type of mathematician who, as a student, enjoyed math contests such as the International Mathematical Olympiad and the Putnam competition. The points and badges are not a good fit for every mathematical temperament, the moderators acknowledge. “There must be hundreds of mathematicians who see these scores next to people’s names and flee in terror,” Morrison says. While the moderators would like the site to be welcoming to all mathematicians, there is only so much they can do to lure mathematicians who dislike the reputation system or are not big fans of the internet in general, Geraschenko says. Enough mathematicians seem comfortable with the MathOverflow format to make the site a very happening place. 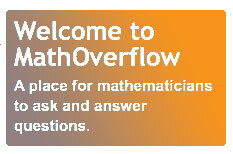 And for them, MathOverflow offers one of the lowest barriers to entry of any online mathematics sites. “If you’re going to participate in a blog, for example, either you’re the author and you have to put a lot of effort into a lot of high-quality posts, or you’re a visitor and you don’t get to be on the asking side,” Geraschenko explains. On MathOverflow, a user can simply put a question out there without having to worry about whether it is significant enough to warrant asking mathematicians to spend their precious time and brainpower thinking about it. “I often get answers to my questions from people I wouldn’t have expected,” Geraschenko says. “And sometimes I get an answer from the ‘obvious suspect,’ but it’s someone I didn’t know well enough to have felt comfortable e-mailing to ask them the question. MathOverflow joins a collection of online tools, such as the arXiv preprint server, that, Ravi Vakil of Stanford says, are gradually broadening mathematics research into an enterprise that welcomes mathematicians who are not necessarily at a few top research institutions. “There are places that, a generation ago, you might say were on the fringes of the mathematics community, but now they are as connected as everyone else,” Vakil says. MathOverflow gives a voice not just to the experts in a field but also to its more obscure practitioners, and to the graduate students who are its future experts, he adds.